Say hey to Robotiky: a robot designed to be programmed by kids using a simplified drag-and-drop software interface on their computer. It’s getting hard to keep track of all the startups looking for cute ways to crack a hard problem: teaching kids how to code without boring them to death. There are board games/play-focused options; paper-based books and craft kits; simplified kids’ coding languages and other dedicated coding education software; programmable toys and tougher programmable stuff like the Raspberry Pi. There’s even a Pi-based build-it-yourself computer kit (Kano). All these projects are looking for fun ways to school the next generation of coders. And, well, lift dollars out of the wallets of mom and dad in the process. This is one sub-set of startups that has a copper-bottomed excuse to plaster cute photos of smiling kids all over their marketing materials. Which certainly appears to be a winning formula, especially when you add robots to the mix. Dan Shapiro’s Kickstarter campaign for his Robot Turtles board game took in more than $630,000 from the crowd, in one example (that game is also now getting a wider release via a partnership with ThinkFun). While interactive bot startup Play-i raised $1.4 million for its programmable robots, in another. The success of many of these projects/startups in raising cash — both from crowdfunding sites like Kickstarter and also from the VC community — is clearly continuing to fuel interest in the space. 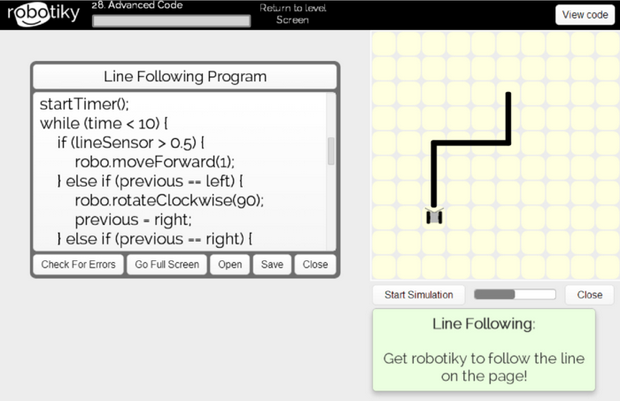 Step forward — or rather roll forward — Robotiky, (yet) another learn to code project that’s launched on Kickstarter and wants to use robots to get kids exciting about playing around with lines of code. Robotiky’s U.K.-based makers describe their brainchild as “Scratch meets the LEGO Mindstorms” — since they’ve mashed up a simplified drag-and-drop programming interface with a programmable robot. Having both elements on board allows for kids to have fun by getting to play with/control something physical (the robot) while also doing some basic coding — via the Robotiky toolkit Scratch-esque drag-and-drop programming interface. The interface lets kids create programs to control the robot by dragging in blocks of code and then clicking to run their program on a software simulator to see what it’s going to do — before sending it to the physical bot via USB and watching the robot act it out in real life. The Robotiky toolkit (viewable here in demo form) includes an option to ‘view code’ which displays the commands that each block of dragged code consists of — so the ‘start program’ block becomes ‘robo.startProgram();’ and so on — to aid the educational process. The robot itself includes motors for movement; light sensors to enable light-tracking functionality; bump whiskers to avoid collisions and map obstacles; a line sensor so it can track a path; and a USB port for uploading programs. Asked how Robotiky sets itself apart from the learn-to-code competition, Screeton highlights two factors: starting with a drag-and-drop interface and progressing to text-based code; and having “both a physical product and really good software to go with it”. “There are some incredible programming tools out there (such as Scratch) that have their own simple visual language which do an excellent job of teaching children how to use it and allow them to do some really cool things. The real challenge is how to get from these simple languages onto ones such as Python which have a very steep learning curve. That is where we come in,” he tells TechCrunch. “Kids love playing with robots and making them doing things. There is no shortage of robots around, but there is a distinct lack of a product with really good software that is really simple to use. Robotiky takes just 5 minutes from opening the box to running the very first program,” he adds. Robotiky’s makers have only been working on the project for less than two months, but already have the coding interface demo up and running, and a working prototype of the bot. If their crowdfunding campaign hits its target of £25,000/$42,000 over the next 29 days they’re aiming to ship to backers in September — albeit they have a ways to go, with just over £6,000 of that total raised so far. How much will Robotiky cost? £119 or slightly less for early bird backers, but almost all the early bird price pledges have already been snapped up by eager geek moms & dads. Perhaps they secretly want an excuse to play around with robots themselves.